Another in a series presenting ancient history and culture through the means of a tabloid newspaper. There are the regular sections on events, sports, etc. with special pages about pyramids and mummifying people. The real estate ads are especially interesting, showing the various types of houses people lived in. There's a detailed description of how to get ready for a party and how to behave once you're there. The illustrations are very good, as for all of these books. ISBN: 0744528631Publisher: London, Walker, 1999Content: This book presents an overview of Egyptian history from 3000 B.C. to 1100 B.C. This includes the earliest stages of Egyptian civilization, rule under the Hyksos and the growth of its Empire in the New Kingdom. This book has used the approach of a newspaper-style format; the information is given immediacy and accessibility which typical history books don't usually have. A lot of information is included. 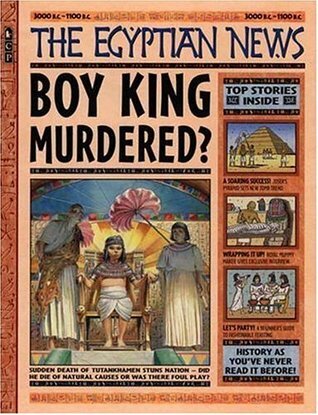 The cover-story ("Boy-King Murdered") leads in to the story of Tutankhamun's death and burial ("Boy-King Dies") with other New Kingdom stories on Hatshepsut ("Queen Rocks Nation") and Akhenaten ("Crazy King Causes Chaos").Format: The book is divided into two sections. The first being "The News" in which major events in Egyptian history are presented as newspaper articles. The second section, "Lifestyle," presents aspects of Egyptian culture as articles on economy (including tax and trade), farming, marriage and family life, work, fashion, and crafts, in addition to summaries of religion, building, and science. There is a lot of information on each page yet accessible for young readers with colourful bright images with clear captions, headings, subheadings and fact boxes. There are spoof advertisements throughout the book reinforcing information in the articles, such as job offers, advertisements for boat-builders, scribes, pots, and amulets and notices of houses for sale.Illustrations: There are cartoon character depictions of the people discussed in each ‘article’ and are generally accurate. It is illustrated throughout with colourful paintings, maps, and humorous cartoons which enhance the text.Text: The text includes lots of description with some slang phrases to create an informal register and gain interest from young readers.Interaction: The text can be used in the classroom when children are learning about Egyptian civilization and as a teaching resource can provide an effective model for report writing in a newspaper article format.Series: The London Walker books in this series range from classic civilizations to modern society. This was a very creative way to teach students about Egypt and it's culture. From an artistic perspective it had a great layout, design, interest, and colour, with very informative illustrations to go along with the text. From a literary perspective I felt it was very engaging and informative and held cute surprises and advertisements to go along with the "newspaper" theme. I'd recommend this one for sure! I really enjoyed the way that this book was set up like an actual newspaper! I thought that the way Steedman presents the information is good and will not overwhelm the kids that choose to read this book. I thought that the pictures were cool to look at and it was fun to be able to see what the book was describing. It is a fantastic book and I think that a lot of children even teens will be interested in this book. This book is such a unique idea and informative. I loved how they laid it out as a newspaper. I mainly think boys will like this book more then girls. Mainly because of the mummification process. It teaches about the culture in a fun way. I would use this book as a lead way into discussing Egypt and their customs. I absolutely loved this book! I loved the illustrations. I also love all the facts included in this book. Any teacher could relate this book to any teaching subject, and kids can learn just about anything they want to know about Egypt. This book has great potential for teaching ideas, but is also a great book for anyone who just wants to learn more about an ancient culture. I loved this book! It was very informative about egyptians in a really fun way. Definitely for higher up readers but for someone who is interested in journalism it is a very fun. I loved reading this and it was so fun to be entertained but informed in the same way! A quick overview of ancient Egypt written as if they were newspaper articles. Too many facts wrong or badly conflated.